A view from our pirogue. 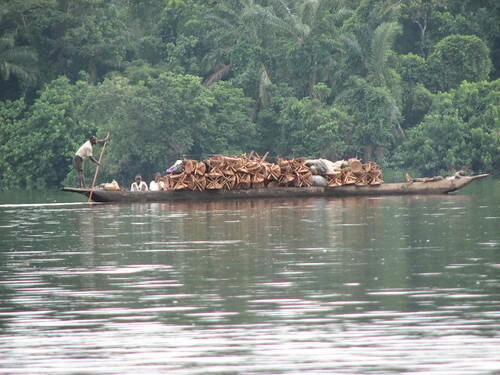 This is a load of stools made from forest rattan on its way to be sold in Kisangani. See more photos on Ashley’s Flickr account. We have been in Opala, south of Kisangani, for one day now. Arrived yesterday evening. Have gone through all the formalities and all seems ok. I’ll be here for two more days before heading off. Stocking up on food and getting the rest of people needed for the teams. So far I have found out some interesting things about the area around here. There is diamond mining going on. The Mai Mai (armed group) are here in the forest. Some people have said there are Bonobo and chimpanzee in the same forest. When questioned about how he new the difference he described the 2 species very accurately and the difference between them. Okapi are here in the forest. The river is navigable but there are some rapids. The first two are probably true, but oddly the village is very poor so no money from the diamonds is arriving here in the village. I don’t believe there are bonobo and chimps in the same forest but there might be chimps and bonobos here but either side of the river. Nobody seems to differentiate between either side of the river as different forest. Still very interesting. Excellent news that Okapi are here. Not sure I believe anything people say about the river as it changes all the time. A person bought a monkey killed by a hunter today. It was ascanius. But interestingly it was the same ascanius as in Epulu (village in the Okapi Wildlife Reserve, a World Heritage Site in DR Congo) and according to the French book* on monkeys that should not be here! So already we have an unusual situation. Unfortunately as I have already said no one could confirm exactly where the monkey was killed. Which side of the river. Going to talk to more hunters tomorrow and try to get as much info as possible. The real adventure is about to begin. The info we get here is going to be amazing I think. There is woman here to do with immigration and she knows Terese and John Hart from Epulu! She mentioned Jojo and Bekah and Sarah [their daughters]. How odd. Her name is Utulo Charlotte I believe. A tall slender woman. Seems plesent enough. All the way along the river so far the forest has been terra firm, no swamp! If the river continues like that then it is going to be amazing here. See more photos of the last few days on my Flickr account. * Gauthier-Hion, A., Colyn, M, & Gauthier, J-P. 1999. Histoire naturelle des primates d’Afrique centrale. ECOFAC, Libreville. This entry was written by Terese Hart, posted on 2007-06-13 at 9:15 pm, filed under Bonobo, Okapi. Bookmark the permalink. Follow any comments here with the RSS feed for this post. Post a comment or leave a trackback: Trackback URL. Hi Ash, this is whetting my excitement incredibly. the biz on the scanius is really neat. None of the subspecies reported for the region should look like the Epulu animals…I would esxpect at the very least the slaonga variet (with the big orage nose–epulu animals have a white nose. Get good pix, to cover the animal. Locate at least as Opala. didnt the hunter tell you where he got it? find out more about those mai mai too. This sounds an incredible experience Ashley. My oh my. Mai mai, unknown rivers, discovery of animals… i am most envious. I very much look forward to continuing to follow this blog. i’am so excited about what you a are doing here. Has anyone ever considered the possibility of using a seaplane? I’d love to support a project like this. I don’t know that much either…I was just dreaming out loud, and wondering if anyone else had dreamt the same thing.